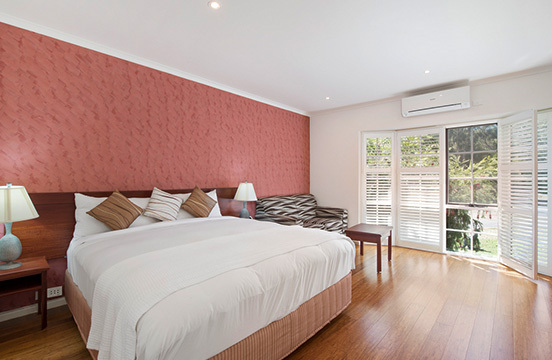 A spacious and modern room with wood flooring and a King bed. A spacious and modern room with wood flooring and a King bed. This room is fully non smoking, is non the ground floor and is located at the bottom end of the courtyard with a pleasant outlook. It has an electronic door lock, a wardrobe, spare pillows, a desk, a couch and an office chair and has a private bathroom with shower facilities, large spa bath and a toilet. It also has tea and coffee making facilities, a coffee maker, reverse-cycle air-conditioning, electric blankets, flat screen television, DVD player, in-room safe, iron and ironing board and a mini bar. If you are looking for something special for a particular occasion or just want to feel special then this the room for you!